Cleveland State University Wind Ensemble, and winner of the 2010 Daniel Rains Concerto Competition. In Ohio, he performed with the No Exit New Music Ensemble, as well as being featured as a soloist in a live WCLV chamber music broadcast. Since coming to Oregon, he has played with the Bridgetown Orchestra during the Overview Effect preview performance at TedX. Luke has taught clarinet in Ohio at Avon School of Music, Tubthumper's Music, and North Olmsted High School. He is currently studying at the Portland State University School of Music in the graduate program, and serving as the Graduate Teaching Assistant to Dr. Barbara Heilmair-Tanret, Woodwind Area Coordinator. 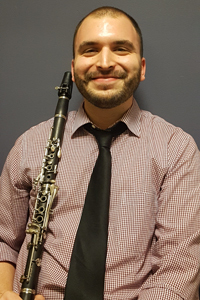 As a teaching assistant, Luke coordinates events in the clarinet studio and other woodwind studios at PSU, teaches private lessons to undergraduate students, organizes and coaches woodwind chamber ensembles and helps organize annual clarinet symposiums. In addition to pursuing a career as a pedagogue and orchestral musician, Luke actively explores the natural wonders of the Paciﬁc Northwest, and his hobbies include hiking, camping, and kayaking. If you have a question for Luke, or wish to contact him, please fill out the form below. The message will be passed along to the Education Center and they will get back to you.